Cooks up to 50% more food than other jumbo griddles! This super-sized griddle can cook as many as 12 slices of french toast at one time. 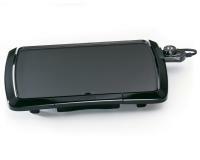 •dimensions are 19" x 15"
Control Master heat control maintains the proper cooking temperature automatically. Cooks all breakfast items very well, but especially cooks eggs perfectly. It needs a larger drip pan. I have used the product a few times now. It is roomy, easy to flip pancakes on, and cleans up nicely. We like the tilt feature for grease. I am glad I bought it. It works great and no problems! It is a very good product and I have told others. I love it. It seems like a gigantic griddle when you take it out of the box, but when you start making bacon and pancakes for 3 it is amazing that you can do it all at once. The only thing that is a little annoying is that the tilt on the griddle, which works well for bacon grease, seems a little loose. But I still think this is a great item. I purchased this griddle for friends for Christmas. We used it Christmas morning for bacon, eggs, and pancakes for four adults and four kids and it worked great. They love it! It does not have all the uneven hot spots their other griddle had and it is much easier to clean up as well. The large size makes cooking for a crowd very easy. WOW! I have never bothered to own one of these things, due to the shear size and therefore needed storage space. But, with 3 boys who love pancakes, eggs AND turkey bacon, I was spending hours cleaning up pans on the weekends, and not enjoying any part of that! So, with my own birthday gift certificates (mind you, I need a million pairs of shoes!!) I bought this griddle and we LOVE it. It never burns anything I put on it, it is easy to wipe down, the temperature is TRUE to the number! I really can do one sheet of pancakes...one of bacon, one of eggs and all 5 of us are fed. I was very pleased with the size of the grill, so many others that I looked at were too small to really do anything with. I would recommend this item to everyone. Excellent-this is the 3rd one I've ordered for use in our clubhouse kitchen. Thanks for such quality products. 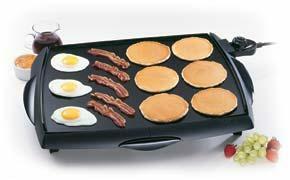 This is a FABULOUS griddle. It will cook twice as much as a regular griddle. 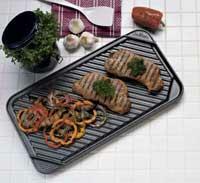 The slide-out tray is wonderful, and clean-up is a breeze with the non-stick surface. 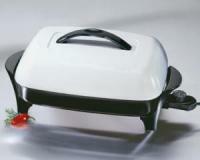 We have ordered 3 of them for use in our clubhouse kitchen. I purchased the griddle for when I go camping this summer. I haven't had a chance to use it yet as I am deployed but I plan on it being awesome. I think the griddle is great. I has plenty of room for the pancakes, bacon, sausage, and whatever you want to cook. I am very pleased. Thanks!